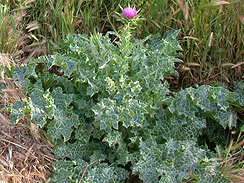 Luckily for me, milk thistle grows in prolific clusters where I live. Here in the sun-drenched foothills, it seems to love partially shaded areas about ten feet away from trees or buildings. It can grow as a small singular plant only a few inches high, or in large patches twenty feet wide and three feet tall. 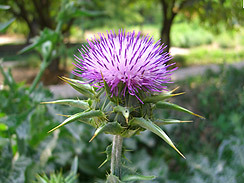 Look for it’s striking zebra-striped leaves, spines, and of course the spiky thistle pod which produces the distinctive purple flower head. Be sure to wear sturdy gloves when harvesting this plant, as the spines are quite painful on bare skin. Wash all wild greens. To quickly remove spines from milk thistle leaves, use kitchen shears or simple scissors to trim the edges off the leaves. Remove and discard stems from greens. Diagonally slice all greens into long 1″ wide strips. Remove and discard onion skin. Cut onion in half, then slice into thin half-moon sheets. Separate into individual pieces. Remove and discard garlic skins, dice garlic. Heat 2 tbsps olive oil in large skillet over medium high flame. Add onion, sauté for 30 seconds, add garlic and saute for 30 seconds more. Add more oil if needed, then place all greens in skillet, turning every 20 seconds or so. Sprinkle with sea salt, pepper and sesame seeds. When leaves have cooked down to approximately half their volume, turn off flame and immediately sprinkle 4 tbspns balsamic vinegar into the hot skillet. Turn leaves to coat all surfaces. You can add more balsamic if needed to coat the leaves, but be sure not to add so much that it puddles on the skillet bottom. You just want enough liquid to coat the leaves. Remove to serving dish and dress top of cooked greens with fresh wild mustard leaves. Serve warm. I recommend using larger, older milk thistle leaves for this dish. They’re easier to de-spine, and the thickness holds up very well at high heat. If other wild greens are unavailable, you can substitute commercial greens suitable for sautéing, like collard, mustard, kale, beet, etc. 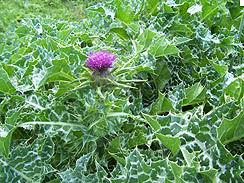 Or try using only milk thistle leaves.